Robert Kardashian may have passed away, but his children keep his memory alive. The attorney, famous for defending O.J. Simpson during his trial, would have turned 73 yesterday. Kim, Khloe, Kourtney, and Rob Kardashian were very close to their father, and there’s no doubt they miss him. Yesterday, for Robert Kardashian Sr.’s birthday (February 22), Kim and Rob paid a sweet tribute for their late father. While Rob wishes his dad could’ve met his granddaughter, Dream, Kim posted a sweet throwback video of her father. 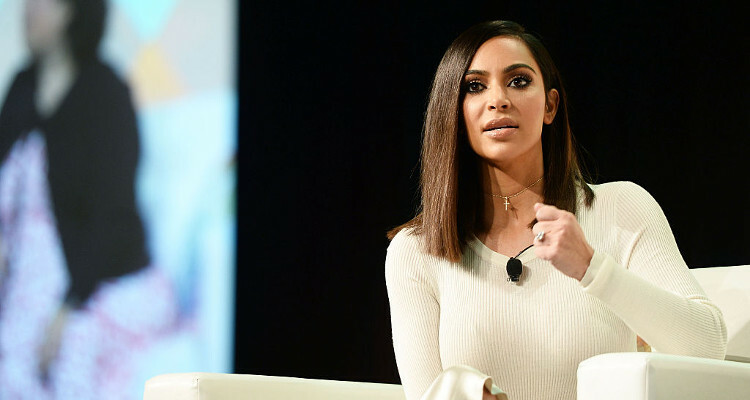 Check out Kim Kardashian’s video tribute to Robert Kardashian right here. Kim posted an old video of her 16th birthday party on her web site, kimkardashianwest.com. She shared the video through Twitter writing, “I found this funny video of my dad and I at my Sweet 16.” The video is of a prank Robert Kardashian pulled on Kim that day. It begins with Robert making an announcement to the party about Kim’s present, saying, “I told Kimberley that she’s getting a car and she’s afraid that I got her a Camaro,” adding that he could feel her shaking. Robert leads a blindfolded Kim outside, and she’s ecstatic to find it’s not a Camaro. 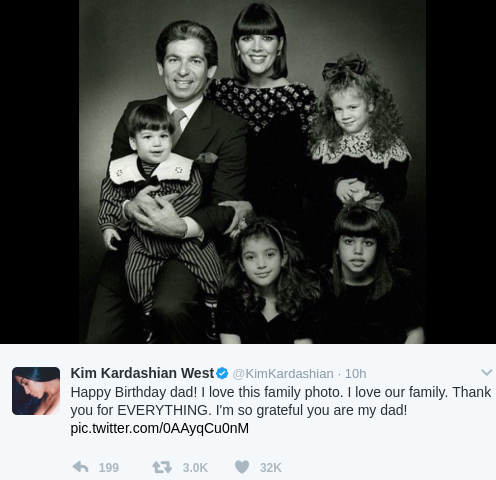 Kim retweeted a picture of her husband, Kanye West, wearing a shirt that said: “In Loving Memory, Robert Kardashian,” with a sketch of the Kardashian patriarch on it. She also shared an old family photo online. 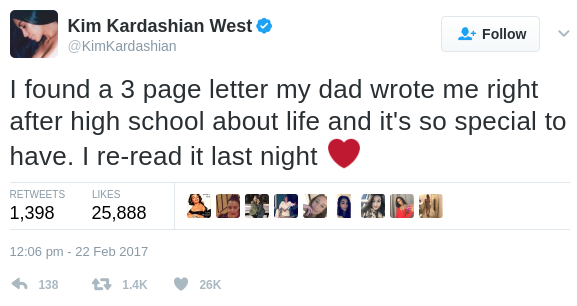 Kim’s final tribute to her dad was regarding a letter he wrote to her when she was young. “I found a 3 page letter my dad wrote me right after high school about life and it’s so special to have. 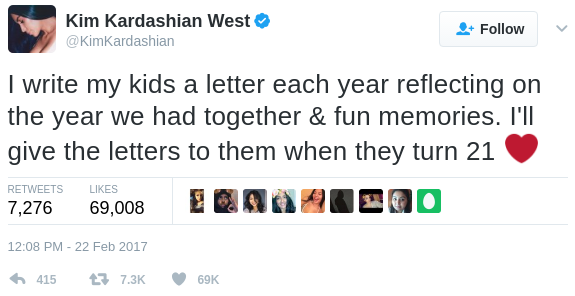 I re-read it last night,” Kim tweeted. She later said she is going to carry on her father’s tradition with her kids.